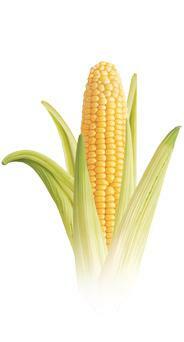 Another member of the grass family is corn (Zea mays) which is also known by its traditional name, maize. The corn plant has an erect, solid stem, rather than the hollow one of most other grasses. It varies widely in height (60 cm - 6 m). The leaves are long and narrow. The many varieties of corn show widely differing characteristics. For example: The number of rows of kernels ranges from 8 to 36 or more. Also the kernel colour differs. There are yellow and white kernel varieties. Corn is native to Central America. It has been a staple food in native civilizations for 7,500 years in Mexico. Corn continues to play a vital role in Native American cultures. Because of that, it has been one of the most important icons represented in the mythological traditions of the Mayan, Aztec and Incan civilizations. The USA almost produce half of the world´s harvest (331,175,072 MT) the next top producing country is China (151,948,870 MT), 2007. Cornmeal is made into thick porridge in many cultures: from the polenta in Italy to the angu of Brazil. Cornmeal is also the main ingredient for tortillas. Popcorn is kernels of certain varieties that explode when heated, forming fluffy pieces that are eaten as a snack. Cornflakes are a common cereal and are found all over the world. Corn can also be eaten as vegetable. Therefore it is harvested and consumed in the unripe state, when the kernels are fully grown but still soft. It must usually be cooked to become palatable. Corn is a major source of starch and cooking oil. Corn syrup serves as a sweetener and corn is also fermented to produce bourbon whiskey. Furthermore corn is widely grown to feed for livestock.